The Reservoir Geeks are again hosting a soiree at the Bottle Rocket motel — on Saturday, July 27 — including the now-traditional Alamo Drafthouse screening of the film. In 1996, Wes Anderson made his directorial debut with the feature film Bottle Rocket. A large majority of the movie took place at the Windmill Inn in Hillsboro, Texas. Due to the economic downturn the motel’s business suffered, thus the Save The Bottle Rocket Motel event was conceived and became reality in July of 2011. Because Wes Anderson fans tend to be more sentimental than any other fans there was a huge turned out for the event. Attendees enjoyed Alamo Drafthouse’s showing of the film with none other than Bob Maplethorpe himself, Robert Musgrave in attendance. After the film came to an end, old and newfound friends took to the pool and motel grounds in a late night party full of laughs and libations. When all was said and done the event was a success and the motel was saved. The magic happened once again in July 2012 with the event being fittingly renamed Lovely Soiree at the Bottle Rocket Motel. Fans came from all over the country to partake in the festivities which once again included a showing of Bottle Rocket, courtesy of Alamo Drafthouse Theaters. This year, on July 27th 2013 throw on you yellow jumpsuit, pop the clutch on your moped and head to Hillsboro, Texas to join us and dozens of fellow film fans for the 2013 Lovely Soiree at the Bottle Rocket Motel and take part in what has become the highlight of the summer (in Hillsboro, Texas… at a motel that was in a movie)! It is important that you call the motel directly @ 254-582-3493. DO NOT BOOK YOUR ROOM USING THE DAYS INN WEBSITE. With all of the casting confusion the internet is producing, we’re happy to set the record straight and report that both Variety and the Hollywood Reporter (THR) have confirmed Ralph Fiennes is in negotiations for Wes Anderon’s The Grand Budapest Hotel. He’s set to play a character named M. Gustave, who serves as the hotel’s perfectly composed concierge. This role was originally reported to be filled by Johnny Depp, but Wes Anderson denied this two months ago. But Anderson’s frequent cronies Bill Murray, Owen Wilson and Jason Schwartzman are in the cast. Couldn’t imagine an Anderson without them. Fiennes recent projects have been acting alongside Daniel Craig in 007: Skyfall and portraying Charles Dickens in The Invisible Woman. Also, THR has noted that Murder She Wrote‘s Angela Lansbury is no longer involved with the movie due to commitments to a stage version of the Academy-award winning film Driving Miss Daisy (also a Pulitzer Prize winning play). Lansbury has been performing on stage every year for the past six years. Lansbury will be playing alongside James Earl Jones and will open next year at Her Majesty’s Theater. Tickets will be on sale October 22nd. The Grand Budapest Hotel is set for release in 2014. Keep checking back at RA.com for more updates. The rest of the interview can be read over at The Guardian. Wes and Owen together again? Just got off the phone with Wes Anderson, unwinding from the Cannes Film Festival with some friends in Italy. (Tough life). Moonrise Kingdom, his strongest film in years, is set to open June 1 in Dallas. He feels good about it, but acknowledges something (or someone) is missing. That would be Dallas’ Owen Wilson, an Anderson staple as an actor and a co-writer. The good news: Anderson’s current script in progress, a large ensemble piece, has a part for his old friend, and Wilson says he’s in. A trailer has appeared for this year’s Woody Allen offering, Midnight in Paris, starring Owen Wilson. We’re glad to see Wilson working with another master after some less than thrilling films. We’ve enjoyed much of Allen’s European work, and this looks splendid. Wilson is joined by Darjeeling co-star Adrien Brody, and a great cast including France’s first lady Carla Bruni. 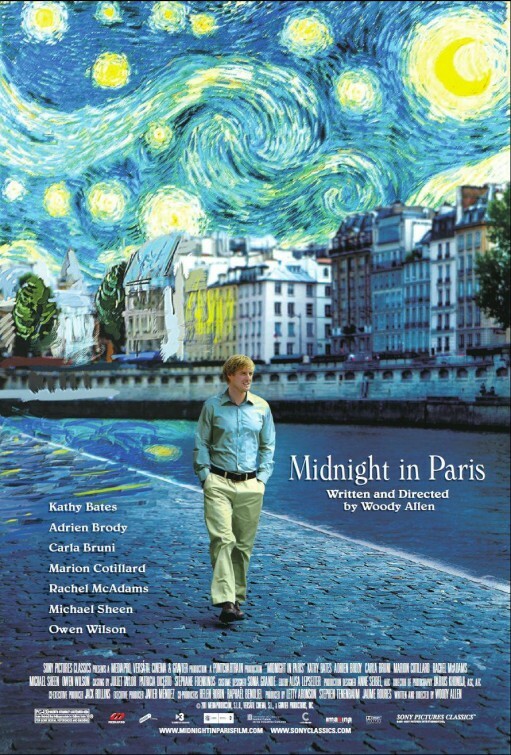 Midnight in Paris is out in the US on May 20th, through Sony Pictures Classics. In the new Interview, Owen Wilson talks to his friend Woody Harrelson about playing poker and his great new film The Messenger. Read the full interview here, or after the break.